Get your flip fops, grab your shades I have found the upbeat, modern and heartwarming summer YA romance you will want to bring along to the beach. 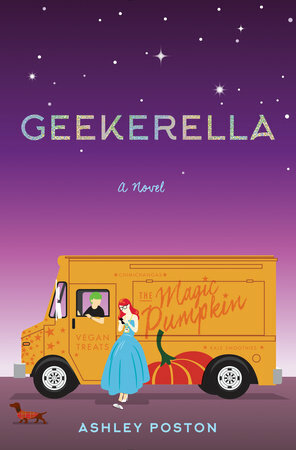 Geekerella is a Cinderella story with a generous twist of fandom and pop culture. Danielle "Elle" is a down on her luck diehard fangirl of Starfield a cult hit show from the 90's. A fandom she inherited from her deceased father, ahem, a BNF if you will. Now she's just trying to make it through high school living with her stepmother and evil stepsisters. Enter our prince charming, Darien Freeman, the teen heartthrob who is playing the lead in the Starfield Movie, he's a a young buff brown actor taking on an iconic role while co-staring with a sweet down to earth female actress who is also an indie film darling, and they are putting on a fake relationship for fans. Stop me if you've heard this. The characters meet cute through a wrong number and start texting and building a relationship while surrounded by a crew of gusty side characters. All roads are leading to a cosmic meeting at a once and a lifetime Cosplay Ball.